I have a love-hate relationship with cars. I’m not a driver. I decided at 18 not to learn after driving a family car around the block a couple of times, and I have reconsidered and renewed that decision at intervals ever since. The reasons were partly aesthetic — I believe cars enhance the individual’s quality of life (while in the car) but degrade the collective quality of life (experienced when out of it) — and partly that I just didn’t want to be bothered with owning and maintaining a car, and basing my lifestyle and identity on it. Nor did I think, as someone living in the London area, that a car was necessary to have a good life. I know this is incomprehensible to habituated car owners and that discussion is pointless so I rarely mention it. Even though I often don’t travel in cars for many weeks at a time, aspects of the experience of driving (or being driven) fascinate me. Cars seen en masse ruin the view, but I can relish the design perfection of particular vehicles, and I’m still seduced by all the attendant imagery. Like everyone else, I have spent thousands of hours gazing out of car windows, excited by the movement and speed, the rapidly changing panoramas of the road, city and landscape, the altered perspectives of space and time, and the blissful disassociation that comes with an accelerated view of the world, never better than when great music is blasting from the speakers and filling the interior. And since I do own an Italian scooter — rarely used these days because cars spoil the fun — I also know what it feels like to revel in the control of your own vehicle on the open road (on a good day) as you zoom along in freedom, and the element of danger is certainly a part of it. As he continues: “movies help us understand the experiential thrill of modernity not only through aesthetic experiences of space — through effects of framing, signs, mobility and so forth — but in transcending the rational and disciplined qualities of driving and moving into a realm of the comparatively irrational, into matters of non-codified thought, instinct and everyday behaviours.” What we see on the screen is experienced again in memory and imagination at the wheel. 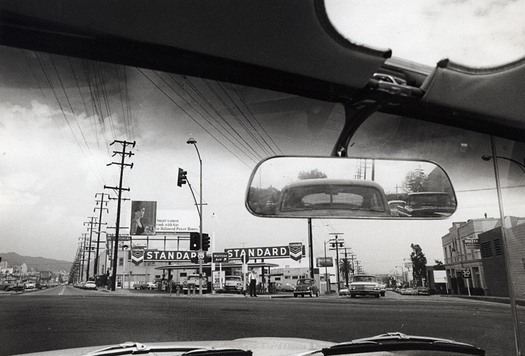 The windscreen’s resemblance as a framing device to the widescreen film image, turning the road ahead and the surrounding scene into a kind of cinema, is often noted. Borden says he watched over 450 films in the course of his research, and he mentions a bibliographic database of more than 100,000 references. 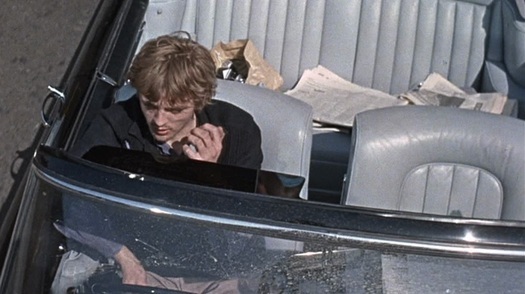 The engagingly catholic selection sifted for automotive epiphanies runs from Claude Friese-Greene’s The Open Road (1925) to Michelangelo Antonioni’s Blow-Up (1966), from Jacques Tati’s Trafic (1971) to Michael Mann’s Collateral (2004), from Chris Petit’s Radio On (1979) to Nicolas Winding Refn’s Drive (2011). 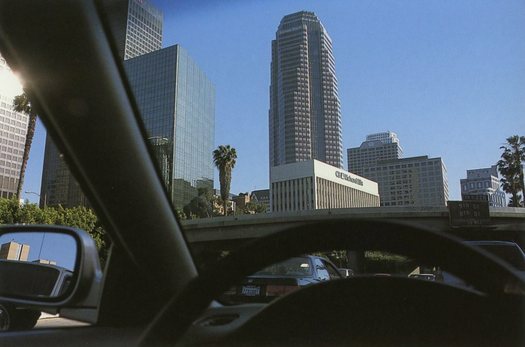 The book’s first image, from Dominic Sena’s Kalifornia (1993), prompted me to revisit that macabre American road trip undertaken in an old 1963 Lincoln Continental in search of notorious serial killer locations. David Duchovny’s character is writing a book about the subject and, as it turns out, receives some unwanted help from one of his passengers played by Brad Pitt. “Driving here is both the site of an unfolding personal event and a witness to a wider social malaise,” notes Borden wryly. It sure is. Kalifornia follows a discussion of Badlands, in a section about driving as a form of philosophical search, or reconfiguration, and then it’s on to the “neo-feminist trajectory” of Thelma & Louise. That film’s famous ending achieved by means of a Ford convertible (no spoilers here) is seen as essentially liberating. In the following section, Borden parses the “nihilism” — his case is well made — of two of my favorite existential road trips, Two-Lane Blacktop and Vanishing Point. He is an attentive and penetrating film critic able to evoke the character and attraction of many kinds of film while deftly interrogating them in support of his themes. In a section on “placelessness,” which begins by citing social theorists such as Marc Augé, Henri Lefebvre and Richard Sennett, his film search uncovers vacant spaces, traffic jams, the emptiness of an industrial zone, bleak autobahns, straight-line interstates, and the New Jersey turnpike. Cutting across films in this way reveals just how much texture and information entertainment-led reviewing (and viewing) can miss, and what rich sources of evidence films can be about social organization, spatial experience, contemporary behavior, and urbanized life. The book gains greatly from around 100 carefully chosen stills, which visualize the arguments while conjuring the experiential, irrational, “non-codified” dimension of driving: the road surface rushing by in Wild Strawberries (I went back and watched it again); New York dissolving through the cab window in Taxi Driver; the political dimensions of the tableau-like car crash scene in Pierrot le fou; the rapturous moment in The Passenger when Maria Schneider stands in the back seat of a Mercury Comet with her arms outstretched, looking at the road disappearing behind her. I’m happy with an everyday existence largely free from car use. But the films, which probe our deepest motivations and pleasures as we speed along the highway, are irresistible. nlatkovic: Yes! Borden covers it. That's rather touching, Samuel J. Ellis. Thanks! 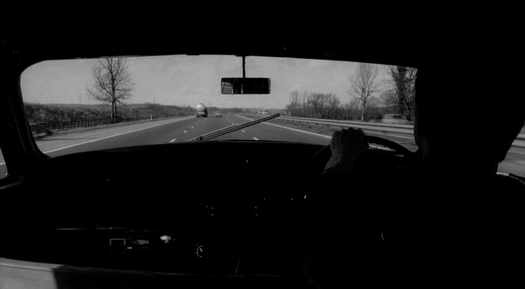 This clip doesn't do it justice, but the first driving scene in a bout de souffle is perhaps the finest insight into character and landscape and the entire french new wave. As you know, you could write an entire piece just on Godard and cars (Band of Outsiders, Alphaville, more from Pierrot le fou, on and on) Thanks for this. Tantalizingly cut short, Bronson, but another good one. The book touches on Breathless several times. Alphaville, too. Thank you Rick. I saw you talk at the Arts University Bournemouth last year. Inspiring stuff! Thanks for your kind review Rick - much appreciated! I am indeed a very keen driver as well as film watcher, and I feel lucky to have had the chance to bring these two things together. Bronson - I could indeed have done the whole book just focused on Godard. Hang on a mo, maybe I should now do this . 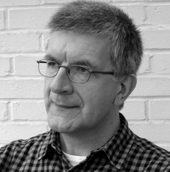 . .
nlatkovic - it is amazing how few people remember this early part of Psycho!